"An irresistible page-turner….the plot is so smartly put together, expertly paced and unpredictable...another winner from Finder, who, as ever, builds suspense without a shred of overstatement." "Finder fans as well as devotees of action-packed suspense have a great read ahead. The taut pacing, staccato chapters, and ingenious plot, especially Finder’s characteristically creative use of digital surveillance techniques, guarantee a literary thrill ride." 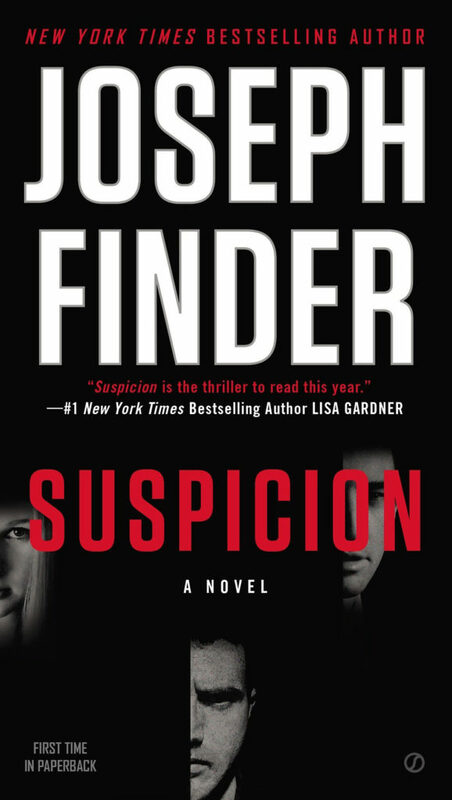 "SUSPICION is arguably Joseph Finder's best novel to date, and he's one of the best thriller writers in the business. He's a master at making the reader feel every emotion, jump at every shock and squirm with every twist that Danny must overcome." "Perfectly timed for summer beach reading season, Joseph Finder’s new novel, SUSPICION, once again demonstrates his mastery of the paranoid thriller….It’s wonderful to see one of our best thriller writers at the top of his game. Lots of readers are going to have lots of fun with SUSPICION this summer." Sometimes the smallest decision can change your life forever. Abe Lincoln’s bodyguard decides to stay for another drink at the bar at Ford’s Theatre during intermission. You finally listen to your know‑it‑all brother‑in‑law and invest everything you have with a guy named Bernie Madoff. Steady returns, dude. A no‑brainer. The tyranny of small decisions, someone once called it. The gate of history turns on small hinges. Danny Goodman’s nightmare began with a quick handshake and a friendly smile.